Q. Do you have information on the graal technique? 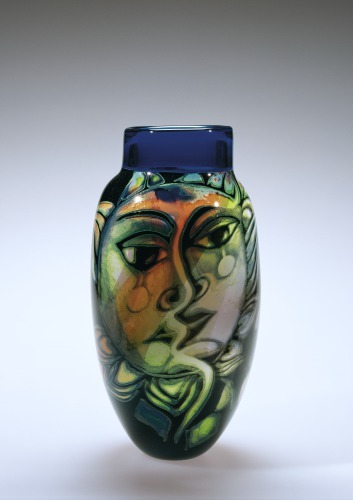 Image: Vase with Female Head. Eva Englund, Designer; Orrefors, Maker. CMoG 99.3.7. Hello! Thank you for your question. We do have information on the graal technique. Beadle, The Venerable. “The Bead Column: Graal Beads.” Glass Line 12, no. 4 (Dec. 1998/Jan. 1999): 14-17. Cox, Gill Mannings. “Graal.” The Guild of Glass Engravers Newsletter, special issue (Autumn 2001): 10-15. Grenier, Frank. “Graal as I See It.” The Guild of Glass Engravers Newsletter, special issue (Autumn 2001): 16-18. Hoerr, Brett. “Creating an Encalmo Graal Vase on the Lathe.” Glass Line 21, no. 3 (Oct./Nov. 2007): 24-29. Mickelsen, Robert A. “A Brief Overview of Graal.” The Flow 4, no. 1, 2006, pp. 62-70. Schneider, Rick. “From the Chop Shop to the Hot Shop.” The Glass Art Society Journal (2012): 120-121. Zirnsack, Arthur., and Dreutler-Zirnsack, Hanne. “Demonstrations: Swedish Graal Technique.” The Glass Art Society Journal (1997): 72.73. The Rakow Research Library will lend designated books from its collection and will send copies of articles requested by other libraries. Your library can request items through the OCLC WorldShare Interlibrary Loan (ILL) system or by direct request through email at ill@cmog.org. For more information, please see our ILL policies and procedures. Could you help me learn more about the history of Graal glass? is it possible to do a graal without stuffing a cup or doing a traditional swedish overlay?